It's Friday, I'm in Love ...with love! red velvet gluten-free equality cookies! Coconut Macadamia Nut Honeymoon Blondies - Guest Post for Crumb Blog! Now now... I know what you're thinking. Let me clear up any confusion: I did not get married. I haven't found "the one" just yet...and by "the one" I mean some tall, dark and handsome chap, preferably bearded and non-diabetic, who finds my brand of weird quirks adorable instead of annoying, thinks beer & burgers make for a perfect first date, speaks fluent sarcasm, isn't afraid to be a complete goofball and volunteers to wash the mountain of dishes I leave in my wake every time I turn on my mixer (does such a man exist? or is that level of dish-washing sacrifice only reserved for saints?). I have an IMMENSE amount of UConn pride. Though I never considered going to the University of Connecticut until my junior year of high school, it was one of the best decisions of my life. And though I grew up not paying any attention to college basketball (despite having a father obsessed with the women's team), within a few minutes of being on campus, I wanted to see what all the fuss was about. I drank the kool-aid and it tasted extra sweet... like historic double national championships. 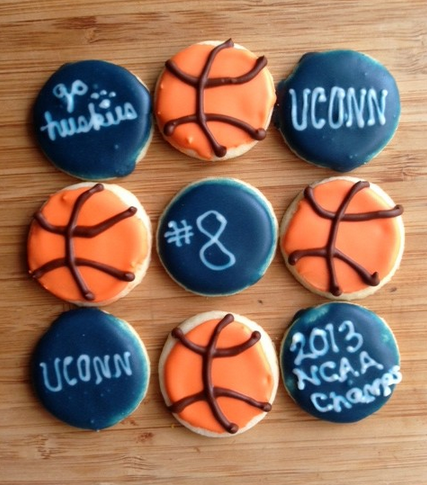 After 2009, I learned NOT to bake for a team I'd like to win, as I baked these UConn cupcakes for the men's basketball team in the Final Four and I felt like it was a jinx!